Equipped with a 14” display, the Dell Latitude E6440 (Dell refurbished) diagnostic laptop strikes the perfect balance of mobility, performance, and durability. Armored with a MIL-STD 810G tested Tri-Metal™ casing, anodized aluminum display back, magnesium alloy wrapped corners, steel hinges, the Dell Latitude E6440 can handle your shop’s tough demands. The StrikeZone™ shock absorber, Fast Response Free-Fall Sensor, and rubber hard drive isolation help protect data from drops and vibration, while the spill-resistant keyboard and LCD protective seal further help protect the system from bumps and spills. The Dearborn Group DPA5 is a RP1210 and J2534 compliant interface complements OEM software by providing service bay technicians with dealer level diagnostics and reprogramming functionality. 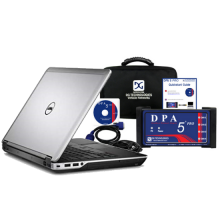 Any aftermarket software that is RP1210 or J2534 compliant that uses a DPA 5 protocol can be used with the DPA 5. The DPA5 is the most rugged Dual CAN RP1210 / J2534 Vehicle Datalink Adapter available. Supports most OEM RP1210 and J2534 diagnostic/reflashing applications.